Last weekend I was on a ‘first-time retreat’ at Ham Convent. It was a wonderful weekend. There was just the right amount of input from the sisters suggesting different ways to pray creatively, combined with hours of uninterrupted silence to explore the beautiful grounds in the presence of the divine. I slept a lot, went to some of the services in the chapel and received numerous grace-filled encouragements from my Creator. 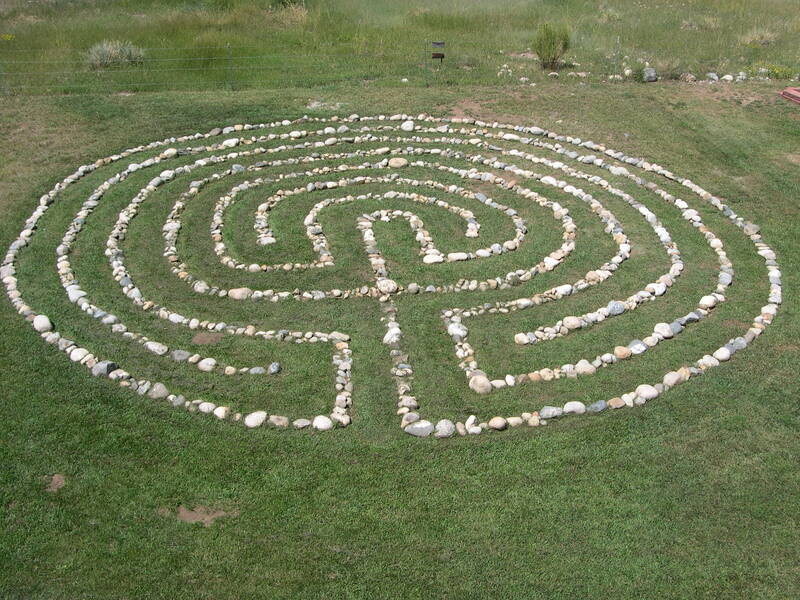 One of the activities I always find helpful in hearing from God is to walk a Labyrinth. For the uninitiated this is following a circular path mapped out on the ground which, unlike a maze, has only one possible route. There are no dead ends and you are led to the middle and out again without missing any section out. However, you don’t start on the outside and systematically work your way to the centre. As you begin you find yourself part way in and then you are suddenly on the edge, before you are unexpectedly right at it’s heart! Previously, I have always thought of a Labyrinth as like a brain. As I’ve walked and meditated before, I have imagined revisiting thoughts and memories stored in my mind and inviting God to revive or reframe them. However this time, I had an experience of the Labyrinth as lungs. It was as if I was being breathed into the heart of God to be refreshed with Her love and affirmed in my personhood, before being breathed out into the world to be a partner in Her mission of restoration and transformation. It had even more significance when I found out that Sunday was Pentecost. This is the day in the church calendar when we celebrate the Holy Spirit as God’s breath being poured out on a frightened band of women, fishermen and social outcasts to empower them for sharing the good news of Jesus’s life, death and resurrection. However, as I engaged with the Labyrinth I also had a reassuring reminder that God’s presence is with us whether being gathered or scattered. A few weeks ago, a friend prayed I might have a new and personal vision of God as my strength and protection. A vivid picture of a large, solid and mature oak tree immediately came into my mind. As I journeyed at the outer limits of the Labyrinth, I complained to God of feeling abandoned, exposed, vulnerable when stepping out and pioneering with spiritual seekers. The tears flowed as I expressed my sense of isolation in the risk taking and the pain of being misunderstood. Yet through my tears I began to become aware that oak trees actually encircled the Labyrinth! It was a physical reminder that either in the safety and comfort of home or alone at the margins – God is with us. Before leaving his friends and ascending into heaven, John records that Jesus said, “‘As the father has sent me, I am sending you.’ And with that he breathed on them and said, ‘Receive the Holy Spirit.’” (Jn. 20:22) I pray that, like me, this Pentecost you might sense Jesus doing the same for you. If I ever make it on desert island discs the one question I already know my answer to is the book I would choose. I first read Jane Eyre when I was 11 and auditioning for the part of Adele in a local, amateur dramatic production. I love it and clearly I am not alone! There seems to be an almost annual reworking of this classic for either the small or big screen and decent audiences are practically guaranteed. It has got me thinking about what makes some tales worth re-telling over and over again. In the case of Jane Eyre it is a gripping yarn that‘s utterly compelling on first read. Yet I don’t believe that in itself ensures such enduring prominence and affection. The characters are fascinating due to the intrigue in their backstories. They are richly drawn by an author who elicits our loyalty for these complex personalities which encompass light and shade, honour and shame. However, I think it is the universality of the themes that really mark this work of literature out as a genuine classic. Obviously it is a love story. But then there are plenty of those that have long since been eclipsed by racier offerings! Essentially, I see it as a tale about the search for identity and how true personhood finds fulfillment in equal, honest and mutually affirming relationships. I have always wondered what would be revealed about the changing nature of a society’s values and concerns by comparing and contrasting different productions of the same classic text over time. For example, in the most contemporary versions of Jane Eyre you do not see the same emphasis given to the idea of redemption from wrong-doing by surviving fire that is strongly evident in the original and there are a lot more overt physical expressions of love than Charlotte Bronte ever included! This is where the culture is reinterpreting the narrative to enforce prevailing attitudes about what is important and behaviours that are socially acceptable and appropriate. The process is essential if a book set in a very definite historical context is still able to articulate something meaningful about what it is to be human in the 21st century. So what about another great, epic story of love, salvation and self discovery from long ago – that contained in the Bible? How can it be creatively reframed so once again it speaks afresh down the ages about the value and purpose of humanity? If it could be retold imaginatively and provocatively what new insights might be discovered that address the culture’s present preoccupations? What can we learn from such popular and attractive presentations of historic fables to make the story that we are actually a part of live again and inform our contemporary experience of life, love and relationship? Or perhaps our sacred text is just too precious and we cannot afford to mess with it! Yet didn’t Jesus in Luke 4:18-21, for example, take the classic lines from Isaiah and radically reinterpret them for his time by applying them to himself? My fear is if we don’t take some risks and subversively re-engage with communicating the message of hope we enflesh for popular consumption as a matter of urgency, it might fade so far from the public consciousness it will be consigned to literary obscurity once and for all. What a tragedy if the Jane Eyre remakes continue unabated but the greatest story ever told sinks without trace! It requires us to know the culture, while being continually remade by the narrative that defines us. As we make room for greater artistic expression and experimentation we might just hit upon the parallel contemporary parables that will attract people to the Light, interest them in the Word and unite them with the Source of everything. It has been the challenge for every generation and now it’s over to us to find the innovative routes for the Gospel that will positively impact our contemporary existence.